With the music player that comes with NOOK Tablet, you can play the music files that you’ve downloaded (or side loaded) to your NOOK Tablet. The NOOK plays most of the common file formats, including MIDI, MPEG, WAV, AAC, and AMR. Connect your NOOK Tablet to a personal computer using the microUSB cable. On your desktop or laptop computer, the NOOK Tablet shows up as a new disk drive called MyNOOK (or, on some devices, as a Removable Drive with a letter code). If a microSD(HC) memory card is in your NOOK Tablet, it will also show up in My Computer (Windows) or in the Finder (Macintosh). Drag the files onto the MyNOOK drive or the memory card. 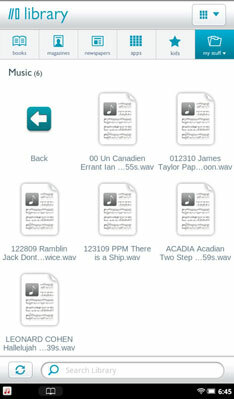 Put audio files in the Music folder in My Files. The official instructions say this is a must. Microsoft Windows usually has a Safely Remove Hardware icon in the system tray. Or go to My Computer, highlight and right-click the drive, and choose Eject. Tap the My Files icon. Find and tap the Music folder. Tap the file you want to play. The music app has two modes: Browse and Now Playing. A red (not rock) band tells you which mode you’re in. To switch modes, tap the icon in the upper-right corner of the screen. Tap three times on the ceiling if you’re a Tony Orlando fan. Shuffle. (Icon: two crossed arrows) The tablet randomly selects and plays songs from your collection. Repeat. (Icon: two arrows in a loop) Tap once to repeat all your songs; tap tap twice to repeat the current track. Album art. (Icon: a box) See artwork for the track that’s playing. Browse. (Icon: a stack of horizontal lines) See available tracks. Search. (Icon: a magnifying glass) Hunt through your NOOK Tablet files to find a particular song or artist. List. (Icon: musical note) See songs and their playing times. Artist. (Icon: microphone) See songs by the artist’s name. When you’re using the music player in Now Playing mode, you can press and hold the gray arrow (to the left of a song title) and drag the file up or down in the list to change the song order.